The seats at Seth Grove Stadium filled up, and the seats at Seth Grove Stadium were empty. Another PIAA Track & Field Championships is in the books and it was another tremendous display of athletics that wowed a packed house at Shippensburg. We saw some great times on the track, as well as some strong marks in the field, despite some sometimes rainy, windy and chilly conditions. There were plenty of highlights, so let's jump in with a quick recap. Rarely do we see an athlete win four PIAA state championships in four years in the same event. But we saw it twice this weekend alone, as Bloomsburg's Jahvel Hemphill won the AA 100 meters for the fourth time and Connellsville's Madison Wiltrout four-peated in the AAA javelin. Hemphill went 10.47 for a new PIAA meet record, closing out his career with a storybook ending. Wiltrout, despite battling some serious arm injuries throughout her career, tossed the spear 160-9 for the win. She is the national record holder. North Penn wins by a half point & more team title wildness! The North Penn girls did just about everything right at the state meet, picking up a pair of relay wins and accumulating plenty of other points and medals along the way. It paid off with a AAA girls' team title win by a mere half point over the defending champions Cheltenham. North Penn was second to Cheltenham at the District 1 Championships, but Saturday was a day for the Lady Knights. On the boys' side, it was a much different story as Carlisle took the AAA team win with just 26 points. Sam Affolder contributed 16 points by himself finishing second in both the 3200 meters and the 1600 meters. Isaac Kole, who won the 1600 meters, gave the Herd 10 crucial points. Milton Hershey was second with 23 points. In AA, The Neumann Goretti girls scored 56 points to edge out the girls from Hickory, who socred 51 points. Both teams racked up a number of relay and individual wins throughout the weekend. In boys' AA, Hickory dominated the competition, scoring 56 points to beat out second place Schuylkill Valley by 29 points. Jordan Geist of Knoch enjoyed a pair of three-peats in the throws. Geist, who's headed to the University of Arizona, won the shot put with a throw of 71-4.5, short of his own meet record. In the discus, Geist went big with a throw of 207-6 to break the meet record. It's just short of his own PA state record, which he achieved last week at WPIALs. Pocono Mountain East's Khyasia Caldwell won her third straight AAA girls' long jump title. The Virginia recruit jumped 19-7.75, her best-ever state meet effort to take the victory. Athens Area's Breana Gambrell also picked up her third straight PIAA title in the AA girls' long jump. The junior also jumped a state meet PR with a leap of 19-5 for the win. She also added a AA girls' triple jump crown to the fold this year, in addition to a silver in the AA girls' 100 meters. Girard College's Thelma Davies, who wowed the crowd at Ship last season, did it once again in the sprints. Davies repeated as AA girls' champion in the 100 meters (11.62) and the 200 meters (24.15). South Williamsport's Katie Jones was golden again in the AA girls' pole vault, breaking her own PIAA meet record. 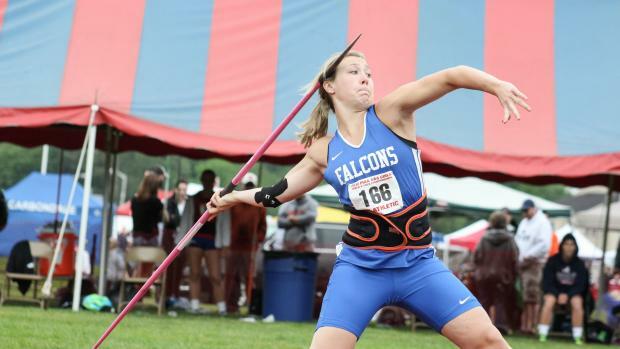 She already holds the all-time best state mark (13-7), but jumped 13-4 to win the state title again on Saturday. Valerie Przekop of Central Bucks South one yet another AAA girls' high jump title. The Stanford-bound senior cleared 5-7 to beat a talented and deep field on Saturday morning. In the AAA girls' 800 meters, Cardinal O'Hara's Olivia Arizin struck gold once again. The senior, who will head to Georgetown in the fall, ran 2:07.49 behind a great kick to take home the state title for a second straight season. Cheltenham's Chanel Brissett won her second straight state crown in the AAA girls' 100 meter hurdles. Brissett clocked a time of 13.35, not long after running a 200 meter prelim for the win. Brissett was also apart of the championship-winning Cheltenham 4x100 meter relay. The Panthers went 46.73 to win the AAA girls section for the third straight season. Uche Nwogwugwu of North Penn, part of that winning 4x8, also repeated as champion in the AAA girls' 400 meters. The UPenn-bound senior ran a PR of 53.80 for the victory. Hickory's Tori McKinley had a big state meet. The senior repeated as champion in the AA girls' shot put with a PR throw of 48-11.75. But on day one, she also won her second discus title with a throw of 150-2 (also a PR). It was her second career discus title, but it came non-consecutively as she won as a sophomore, but took second as a junior. Another Hickory thrower--Evan Blaire--also won a pair of titles. He threw 186-5 in the AA boys' discus, his second straight title in the event, on Friday, and then came back on Saturday to add his first career shot put crown with a throw of 64-5.25. Jordan Williams of Sharon won her second straight AA girls' 1600 meter crown. This time, Williams went sub-5 for the first time in her career, running 4:59.01 for the win. Mount Carmel Area's Maura Fiamoncini took home a second straight title in the AA girls' javelin. It came down to the final throw and Fiamoncini pulled out her biggest throw---a 144-8---to win the event by a mere eight inches. Neumann Goretti repeated in the girls' 4x400 meter relay. The Saints clocked a time of 3:53.51 for yet another state crown. The Seneca boys won another 4x800 in Class AA. They dominated the field and ran 7:48.92 for the win, which is also a PA#9. Greg Lauray of Notre Dame-Green Pond won another state title in the high jump. Last year, he won the AAA title, but his team moved to AA this year and Lauray won again, clearing 6-11 for the win. For a second straight year, North Allegheny's Ayden Owens won the 300 meter hurdles. Owens ran a personal best of 37.47. Earlier in the day, he also won his first state crown in the AAA 110 meter hurdles in a time of 13.76. Meadville Area's Journey Brown ran 10.43 to run away with the AAA boys' 100 meter title. Brown also broke Leroy Burrell's long-standing PIAA meet record in the process. Brookville's Ryan Thrush ran a strong race in the 400 meters, winning in a time of 48.18 to repeat as Class AA champion in the event. Anthony Milliner of New Brighton took home the AA boys' triple jump title for a second straight season. The state leader jumped 47-5.75 for the win. Brendan Sparr of Schuylkill Valley, despite battling injuries this season, came through on Friday to win the AA boys' long jump crown. Sparr jumped 22-6.25 for the win there. The boys' distance events provided some great drama. In the AAA boys' 3200 meters, JP McCaskey's Nathan Henderson laid down a ferocious kick to run by Carlisle's Sam Affolder to take the win in one of the day's most thrilling races. Affolder came back in the AAA 1600 meters. But stealing the show there was his Carlisle teammate Isaac Kole. Kole ran an incredible race with a great kick for the win in 4:12.47. Early in the day, the Central Bucks West boys ran a US#1 in the 4x800 meter relay. The Bucks ran 7:40.14 to beat out defending champs State College Area for the AAA title. Taryn Parks of Greencastle Antrim took home the win in a loaded girls' 1600 meter field. Parks ran 4:45.81, which the fastest time in the country by any freshman girl. She bested a group of competitors which included her usual rival Marlee Starliper of Northern and Abington Heights' Katie Dammer. Dammer placed second in 4:48.51, while Starliper placed third in 4:49.68.